In the last one and a half weeks of this month some of my roses have been starting their spring flush. It is so nice to see roses blooming in the garden again, even though there are just a few flowers open yet, but with each day they become more. We are having relatively cool weather here, which is nice since it makes the flowers last a lot longer on the rose bushes. 'Grandmother's Hat' receives the honor to open this blog post, because she was the first rose of the ones planted in the ground beginning to flower this spring. I am just in love with her blooms and the fragrance is very seducing, too. 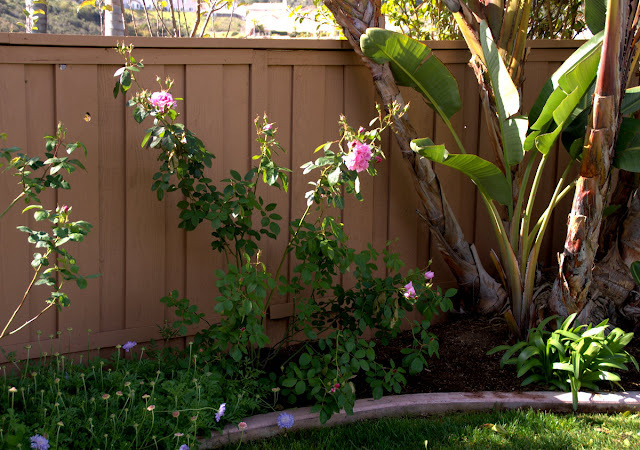 This rose is a found rose and its true identity is unclear, but it is supposed to grow very well almost everywhere in California. I just can agree with that for my garden. It is completely clean despite the fact that I planted it in a little bit of too much shade and it is growing like gangbusters. On the photo above you can see the whole rose bush. For a rose that is approximately a year in the ground 'Grandmother's Hat' has put on quite a bit of size. The longer I grow roses the more important the look of the rose bush itself becomes to me and therefore I like to see bush shots of a rose before I make a decision to buy it. So I have decided to incorporate more "whole body"- rose pictures in my posts for you, my dear readers, too. Hope you find it beneficial! Another first rose of the season: 'Pope John Paul II'. 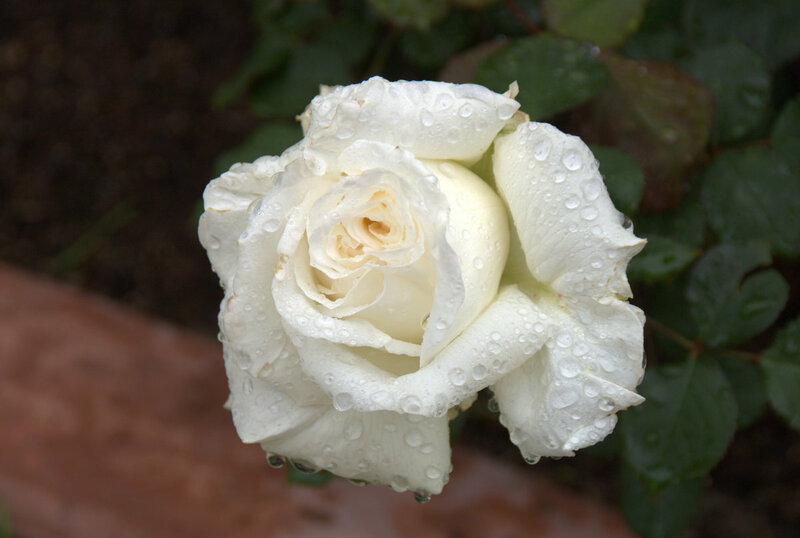 This is my favorite white Hybrid Tea rose. He is three years in the ground now and has gained some maturity. It looks like I will be getting an incredible spring flush from this rose. This is 'Baronne Prevost'. The blooms are so sumptuous and lovely but the rose bush itself is a disaster in my garden (click here to see it in my previous post). A flower spray of 'Marie Pavie'. She has her home in my front yard and is almost non-stop blooming year round here in my garden. That is wonderful, of course, but by now I found out that she has one drawback. Even with the relatively low temperatures that we are having her flower petals fry easily in the sunlight and they are also extremely sensitive to water be it from the rain or from the sprinklers. So there is a lot of deadheading to do, if I want this rose to be looking nice. 'Yolande d'Aragon' also starts to open its first cluster of blooms. This Old Garden Rose is so charming and incredible fragrant. Certainly one of my favorite Hybrid Perpetual roses. You can see some rain damage on the petals of the first flower of 'Sweetness', but I think it is still very pretty. First bloom of 'Zephirine Drouhin'. I am not such a fan of the flower shape of this rose, but the fragrance is outstanding. A real jewel of a rose is 'Reine des Violettes', another Hybrid Perpetual. The color of this one is unmatched by any other rose that I have ever seen so far. It is just a very special matte violet with gray undertones. The rose is a diva, just like you would expect from a queen, but so far I put up with it because of its incredible beautiful blooms. 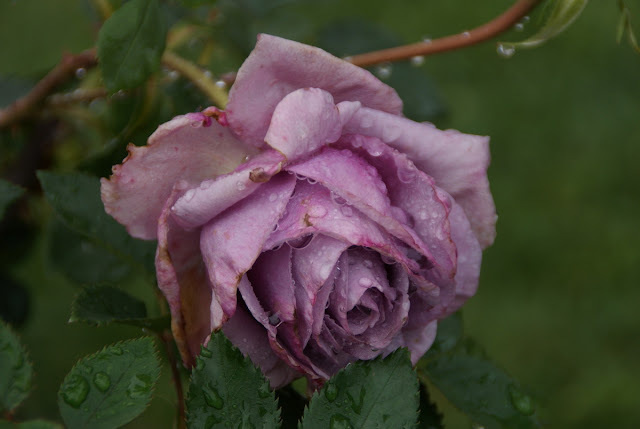 The last rose that I want to present in this post is 'Moonstone', a Hybrid Tea rose. Just recently I planted it from a two gallon container into the ground and the rose is growing fairly well now. This was the first bloom this year and it was so heavy that the cane which holds it broke off. I took it in and was surprised to notice a very distinct, pleasant fragrance. There is some rust on the leaves right now, but hopefully the rose can shrug it off as it matures. Hello to the other side of the world! You have so beautiful pictures ans so exotic garden. We here in Finland can only dream about that kind of climate. Our summer is only three months long and now we have still half meter snow. But lucky we, spring is almost here :) And welcome to read my blog too. Wonderful presentation, Christina ! I like to read about your problems with the roses, it's so important for a gardener ... Thank you ! A blog where I can dream about. Fantastic photograph's and you are right about "how lookes" the shrub it self. Sometimes I bought a rose from the beautiful flowershot I saw but the shrub it self was not nice at all. Have lovely weekend. Here in Holland, many roses have to begin deep from the earth . Many frost, after the winter with 20 degrees of frost, which normally is not here. Maalaispuutarhan Marketta, a warm welcome to my blog and thanks for your nice words about it! Wow, you still have half a meter of snow?! Hope spring comes to you soon. Finland is a really beautiful country, though. Thanks, Dani! I appreciate that you like to read about the things that don't work out in my garden, too. I have learned so much from other bloggers, who don't only report their successes, but about their failures, too. By now I really prefer reading gardening blogs over garden magazines with glamour shots only ;-)! Marijke, I am flattered that you like my photos! It is interesting that very often the rose bushes are not shown, when a rose company is advertising their roses. They catch us with the beautiful rose flower photos and we fall for it :-). Happened to me, too! VertGrenouille, thanks for your compliment about my roses, but sleeping in my garden is not a good idea right now. It is still pretty cold at night here and you would be drenched with water by the sprinklers ;-). Marian, so sorry to hear that you had such a harsh winter in Holland. I have read about it also on other dutch blogs. Hope all your roses survived the frost and that they grow back to their old glory soon. After all roses are tough plants! So many beautiful blooms. Your garden will soon be heavenly! I agree with you about the bush shots - I've been thinking I need to include more of those, too. I had been contemplating Marie Pavie for my garden, but decided on a different rose instead. Your comments make me think I did the right thing. She would have considerable amount of frying sun here! Dear Christina ~ Lovely roses once again. My favorites this time ~ Grandmother's Hat and Marie Pavie. Sigh. So many lovely roses you have there - if only you could transmit the fragrance over the internet too somehow! I love that 'Grandmother's Hat' - not one I had ever heard of before. Kochasz róże i troszczysz się o nie, można to wyczuć z opisu ich. Masz już ich sporo kwitnących teraz w ogrodzie.Zdjęcia też im piękne robisz. Pozdrawiam ( mój piesek ma się coraz lepiej). *** You love the roses and do not care about, you can sense it from the description of them. You already have a lot of them are blooming in the garden. Beautiful pictures of them doing it. Yours (my dog is getting better). Le Style, thanks for your nice comment and welcome to my blog! The Sage Butterfly, I can totally understand your impatience to wait for your roses to bloom again. I was waiting so eagerly for mine to start, too, and partly I still am, because some have not even set buds yet! Holley, glad to read that you also feel to see rose bush shots is important. Regarding 'Marie Pavie' I will definitively observe her closely this year and see how she holds up against the summer sun. I am curious to know what kind of rose did you choose instead of her for your garden? FlowerLady, thanks for your compliment in terms of my roses. 'Grandmother's Hat' seems to be a real winner. I am wondering how she would deal with the humidity in your climate. If there is the slightest chance that she could do well I really would recommend to get her. She is such a lovely rose! spurge, thanks for your kind words! That would be something if fragrance could be transferred over the internet. 'Grandmother's Hat' is truly a beauty. It is not widely known even in California where it does so well. Absolutely wonderful...such beauties, especially 'Reine des Violettes'...the color of that one is stunning! I agree with you about the form of the rose bushes...just as important as the blooms! Giga, thanks for your kind words about my roses and yes, with no doubt I love roses unconditionally :-)! I am so glad to read that you dog is doing better! Scott, welcome to my blog! Thanks for the "rose praise". I am happy to read that you have fallen for 'Reine des Violettes', too :-)! Great that we share the same opinion about the importance of the rose bush itself! Twoje róże są piękne i tak ładnie o nich piszesz. Ja jeszcze nie wiem czy moje róże przeżyły zimę, bo u nas pogoda nie taka ciepła. Ale chętnie zajrzę tutaj popatrzeć jak Twoje pięknie kwitną. Simply beautiful. This makes me want to grow roses in my own garden! Pleased to meet another great garden blogger. Thanks for your comment over at WMG. Thanks for your opinion of 'Zephirine Drouhin' as I have been comtemplating this rose for quite a while. It may still be worth the space even with an a more random bloom, but I am glad to know that is what I should expect! Thanks for the help. I have teeny buds on my roses right now and can hardly wait til I have as many blooms as you do. :o) I really love Reine and Zephrine. They sound like naughty French sisters that would be fun to hang out with. I love the stem and foliage of Marie Pavie. Almost red... Also, the bloom of Pope John Paul II are so pretty. Mine are now in bud. It looks like your garden is off to a wonderful start..... Happy Spring! Jeg kom tilfældigt forbi din blog. Tak for de smukke billeder af dine mange skønne roser. bustani, welcome to my blog and thank you very much for your kind words about my roses and my writing! I hope your roses survived your winter! Roses are often way tougher than we assume! Mario, if my blog has inspired you to grow your own roses, that would make me very happy. If you choose the right varieties for you climate they are easy to grow! Julie, welcome to my blog! Regarding 'Zephirine Drouhin', please have in mind that roses behave quite differently in Southern California, than where you are gardening. But I have seen Zephi in the UK and it was an absolutely wonderful rose. If you have the space I would certainly try her! Casa Mariposa, if you wait for the rose buds to open it takes forever, doesn't it? I had to chuckle at your description of Zephi and Reine :-)! You have such a great humor! The Redneck Rosarian, I love the foliage of 'Marie Pavie', too, but hadn't noticed that her canes are red. Thanks for making me look closer :-)! Couldn't agree more with you regarding Pope John Paul II. Looking forward to seeing photos of yours on your blog! Landbohaven, I am glad that you ended up at my blog by coincidence! Thanks for your nice words and have a great day, too! Agatka, welcome to my blog and thanks for your kind note! You have so many rose-types!! The roses with water droplets on them - they look so surreal and beautiful. It is always exciting to see those first rose blooms in spring and yours are just lovely! Grandmothers Hat is my favorite I think, she is a rose I always admired and would love to have in my garden. Not sure how she would fair with our humid southern summers though. Look look forward to seeing more of your roses! Gorgeous roses, Christina! The size of the cluster of GH is amazing. I love the color of RdeV, I hope it will keep being so purple. We have had lots of cold weather, and my roses have stalled, lots of blind growth too :). KL, thanks, I consciously try to grow roses from different rose classes, just don't want to miss out on all the variety that you can have with roses :-)! Meghan, my 'Grandmother's Hat' is only one year in the ground and seems to be a very nice healthy rose here. I have no idea how she would do in a warm and humid climate, though but why not give her a try if you like her? Masha, thanks, I don't know if that is an unusual big spray of 'Grandmother's Hat' since unfortunately I have never seen this rose bloom in person before I grew my own. But if you say so it makes me happy, because it indicates that the rose loves my garden :-)! Until lately our weather also has been unseasonal cool, but things are changing now. I'm in rose heaven after reading this! And a mighty fine scabious you have there too. You must live in the best place in the world for growing roses. Mine are just starting to build up leaf growth after their March pruning, but I know they are not going to look as good as yours. Thanks for the inspiration though! Martin, thanks for your very nice comment! The scabiosas are relatively new but so far I am very happy with this variety. The name is scabiosa hybrid 'Giant Blue', just in case your are interested. The flowers are much larger than my other variety scabiosa causasica 'Butterfly Blue' and make very good cut flowers. San Diego is definitively a great place to grow roses, but we have our challenges, too. Mainly powdery mildew and rust are threatening the health of the roses here. This my first visit to "Organic Garden Dreams." Thank you for joining my blog. That was such a nice surprise when I logged in tonight. :-) Your roses are absolutely beautiful! Baronne Prevost and Moonstone are my favorites of the beautiful bunch. I've just started getting back into roses, and recently ordered Buff Beauty and Don Juan from the Antique Rose Emporium. I'll definitely be back to visit. Beth, a warm welcome to my blog and thanks for your compliment regarding my roses! Great that you got back into roses. They are so much fun and rewarding to grow in my opinion. See you hopefully soon here again :-)! wellcome to my blog Christina! So I have the chance to see your beautiful roses and - your roses are just amazing! Marie Pavie is my favorite. We have to wait some weeks until the first early roses might bloom. See you soon and warm greetings from germany! I adore roses. I have plans to coat my house with them when we move to our zone 7/8 property later this year. Roses in my current Zone 3 garden are a leap of faith but I persevere as I simply must have them. Renate, thank for visiting my blog! I am delighted that you like my roses. I am born and raised in Germany, so it is special to me to have someone from Germany leaving a comment. Looking forward to my next visit to your blog! Susan, wow growing roses in zone 3 must be quite challenging! I wouldn't be without roses either no matter where I live :-)! Your roses and photo's are stunning. You have a beautiful collection of roses in your garden. My roses are starting to put on a show in my Zone 7b garden. Graceful Gardener, thanks for your nice comment! Have to go to your blog to look at your roses, too! Every time I read your blog i'm impressed,you have so many roses! I hope, someday I'll have such a garden with many, many roses. Mihai, having a lot of roses, has advantages and disadvantages. When they are in bloom it is wonderful, but if they need to be deadheaded after they are spend not so much :-)! Still if it is your heartfelt wish I hope your dream becomes true.